It is still the easiest laugh to get from a group of journalists -- professionals or students -- throughout the world. All that needs to be said is: “We all know you got into journalism to do math”. The laughs come because most journalists have seen themselves primarily as storytellers and word artists. For them, numbers are worrisome, boring, or interfere with the flow of an article. Furthermore, the perception of journalists’ inadequacy and inability to deal with numbers has been increased by mathematicians and statisticians over the decades. They’ve pored through newspapers and websites, listened to radio, and watched broadcast news with the purpose of finding errors and ignorance whenever journalists have reported on numbers. The book, A Mathematician Reads the Newspaper, by John Allen Paulos was relentless in its pursuit of journalists’ mathematical misfortunes. That book followed his previous book, Innumeracy, which was broader in its criticism of math impairment across many professions, but included journalists among those wrongheaded. Paulos’ books and other statisticians’ criticism implied that journalists hate numbers and can’t do math and, perhaps, never will. But that has become untrue over the past two decades. This change can be linked to the surge of journalists using data and to the self-realisation that they often do some kind of math every day. Whether it is deciphering budgets, examining salaries, or looking at accident or murder rates, most journalists these days are constantly counting and comparing numbers. Certainly, up until the 1980s, it was the rare journalist who understood the difference between mean and median, could calculate a percentage difference, or do a simple rate. At the Kansas City Star, where I worked in the 1980s, there was a copy editor who knew how to do percentage difference by paper and pencil and he sometimes had a small line of reporters at his desk waiting for him to do that calculation for each of their stories. 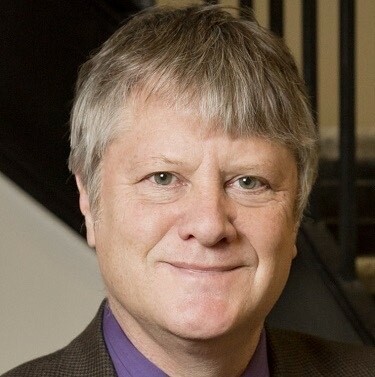 Brant Houston is an award-winning journalist, journalism professor and author. He was an investigative reporter in US daily newsrooms for 17 years and was executive director of Investigative Reporters and Editors for more than a decade. A major example of innumeracy over the years was that news stories would favour sports team owners -- without realising it -- during labour negotiations between owners and players. These stories would cite the average salary of players rather than the median, thus letting the huge salaries of a few star players inflate the average. If the reporters had used median, they would have seen how few players made the average and the perception that all players were millionaires was false. In other instances, journalists would report that it was fair for workers to get the same percentage increase in wages, without realising that a 3% increase for someone making $150,000 (it’s $4,500) is much greater than a 3% increase for someone making $30,000 (it’s $900). Journalists would also fail to use rates for putting raw numbers in perspective. One city would be called the murder capital of a country based on the total number of murders, despite having a much lower murder rate than other cities. A road intersection would be deemed the most perilous based on total number of collisions, rather than the rate of collisions compared to traffic. 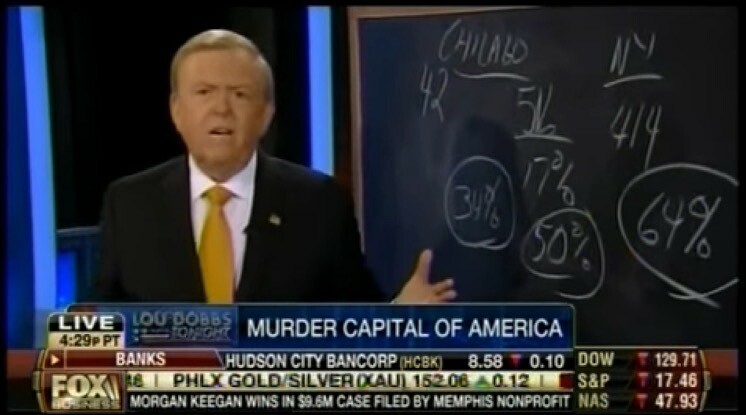 Always check the mathematics behind ‘murder capital’ claims -- sometimes it isn’t as robust as it seems. An intersection that has a hundred collisions a year, when the traffic through it is 100,000 cars a year, is less riskier than an intersection that that has a hundred collisions a year with only 10,000 cars passing through it in the same year. 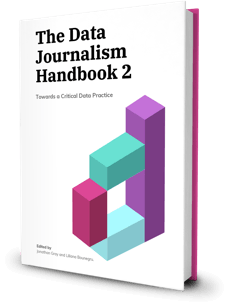 Yet it was in the late 1980s that a small band of journalists began to embrace the power of accurate numbers and calculations as they began to work with data. They also discovered the spreadsheet. And, inspired by Philip Meyer's book, Precision Journalism, they came to see the power of math and numbers, rather than scorning or avoiding them. Data journalism workshops given by Meyer at the University of North Carolina and by Investigative Reporters and Editors with its companion organisation, NICAR, drew hundreds of journalists eager to learn data analysis. At those workshops and then at NICAR conferences, they received training that included math -– training that was seldom, if ever, offered in classrooms for journalists or newsrooms. In fact, journalism professors wanting to keep up with the profession attended those workshops and became the few including math and numbers in their classes. In those workshops, I and my colleagues found the previous teaching of math had lacked the appropriate approach and perspective. The best approach demystifies ’math’ and focuses on the basics that allow journalists apply math in a practical way –- that is, to summarise numbers, put them in context, and determine if the numbers are misleading or lies. The result of the workshops -– which spread globally -- was an increased understanding of numbers and thus the ability to write more lucidly about those numbers. Numbers were not boring if they revealed shocking ethnic disparities, large numbers of failing bridges, or alarming rates of murder. It was clear it was much easier to deal with numbers if the teaching led to that immediate illumination about a topic. In addition, the use of spreadsheets, be it Microsoft Excel or Google Sheets, made the math easier because journalists could rely on automatic calculations once the numbers were entered in. That also increased journalists’ confidence in interpreting statistics and surveys, as well as encouraging them to employ more advanced statistical methods. 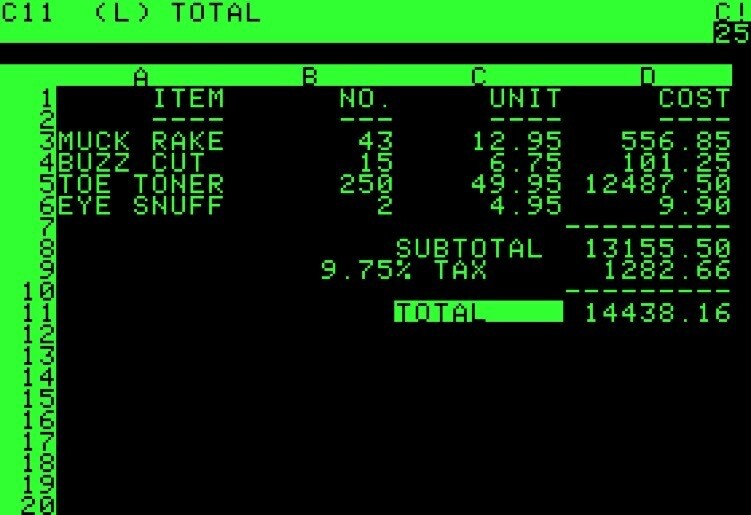 A screenshot of Visicalc -- the first spreadsheet that combined all essential features of modern spreadsheet applications. Credit: Wikimedia. One manifestation of this change in journalism can be seen in the number of websites and news columns devoted to the interpretation of numbers. Among the places devoted to numbers: a regular Saturday column by Jo Craven McGinty on numbers in the Wall Street Journal, the Upshot column in the New York Times, and the FiveThirtyEight website by Nate Silver. Another manifestation is the Philip Meyer Awards, international awards given by Investigative Reporters and Editors, that recognise the best uses of social science in journalism. Year after year, since 2005, these awards show the progress that has been made in the field's numeracy. For example, an investigation by Bayerischer Rundfunk and Der Spiegel, No Place for Foreigners. Why Hanna is invited to view the apartment and Ismail is not, revealed discrimination against foreigners in the German housing market through a large-scale survey of landlords. They found that potential renters with Arab and Turkish names were frequently ignored. This investigation drew heavily on number-based experiments, like the difference in chances pictured above. Read the full piece here. In another award winner, Buzzfeed and BBC used a million simulations of tennis matches to discover suspicious patterns in the shifting of betting odds and players who lost matches they statistically should not have lost. In the US, journalists at several newsrooms have shown widespread cheating on standardised tests by showing that test scores were way too high based on analysis of previous years' scores. In a similarly math-based investigation, ProPublica uncovered a disturbing trend: temporary workers are hurt up to six times the rate of permanent employees, and their injuries are more severe. And there are many examples of smaller but effective stories using numbers. Years ago, a reporter, who had just received training in spreadsheets, found the city she covered had uniformly miscalculated percentage changes in its annual budget. Some reporters found political associates in governments receiving much larger salaries than regular employees. Others calculated serious cost overruns in government programmes. With just a spreadsheet, a journalist can let the software do the counting and calculating, allowing them to concentrate on the purpose and result of their inquiry. It also opens the door to understanding more advanced statistics, and the use or misuse of statistics by governments and businesses. The mathematical tools in a spreadsheet can be divided into two groups: data management and calculations. Let’s begin with filtering. There’s a recreational boating accident database in the US that has details of accidents that led to deaths. Here is a sample of that data, which is probably collected in many other countries. An abbreviated version of the recreational boating accident database kept by the US Coast Guard. 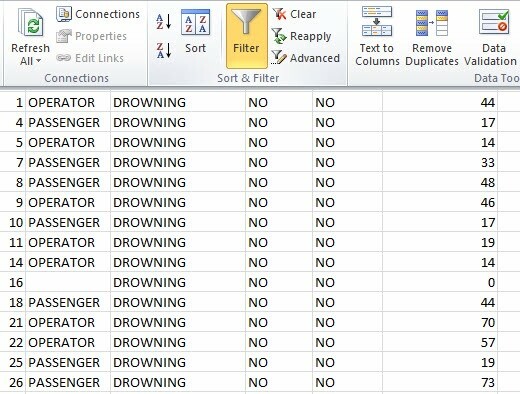 By using the filter function in a spreadsheet, a journalist can quickly answer the following question: How many persons died of drowning who were not wearing a life jacket (PFD – Personal Flotation Device) and could not swim? It turns out that nearly two-thirds of the drowning deaths include people who could not swim and did not wear a life jacket. A slice of the data appears below. All the journalist has to do is click the filter icon, picking one of the scroll arrows in a column, and choose the criteria. The journalistic value of using this tool is immediately clear because the reporter now has a story showing that some of the deaths could have been preventable. 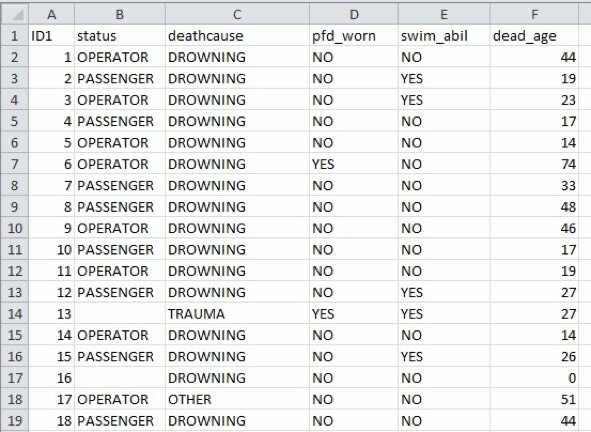 This shows only the accidental boating deaths caused by drowning and in which the victim was not wearing a life jacket and could not swim. Simply sorting numbers can bring meaning to them, or it can take the political spin off them. An abbreviated version of the Healthy Life Expectancy database from the World Health Organization. Sort the countries by the highest life expectancy to the lowest, and you can see the biggest differences –- potentially the start of a story on why some countries are higher and some are lower. This is done with a simple calculation of subtracting the life expectancy of males from females, and sorting by that difference. As you can see, many of the largest differences are in countries that were a part of the former Soviet Union. Again, this could be the start for an illuminating story on why that is. 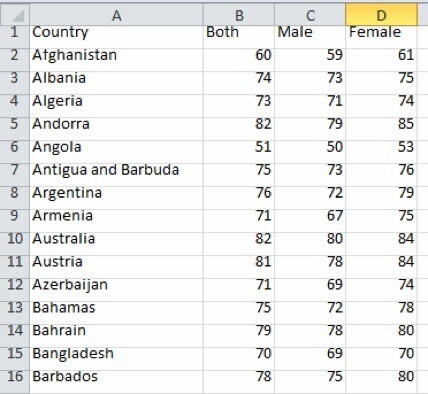 The Health Life Expectancy data with the calculated difference between male and female ages sorted by the largest difference to the smallest. Grouping numbers in categories and counting or summing them (or both) can give a valuable overview of a dataset. A spreadsheet has an excellent tool for summarising, called a Pivot Table. Let’s have a look at how this tool can help discover which retailer sells the most guns in Missouri. By clicking on the Insert tab and then on the icon for the Pivot Table, journalists can choose to count by the numbers of licenses a business holds. The Pivot Table icon has been selected in the left hand corner. 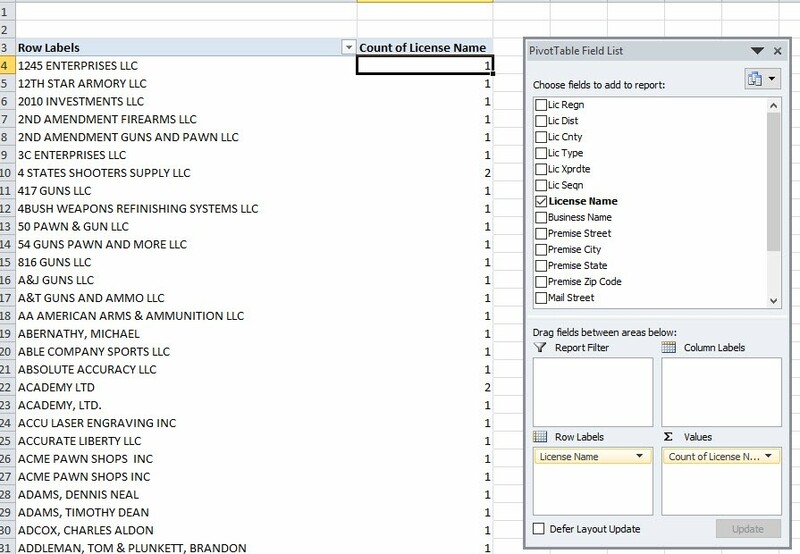 The Pivot Table allows you to count the number of each business with licenses by choosing from a list in a selection screen. This pivot table shows the number of dealerships licensed under a unique business name. 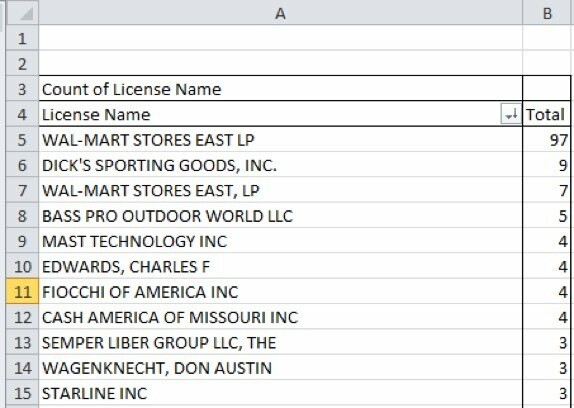 Sorting from high to low based on number of licenses, it’s possible to see that the corporation Walmart has the most licenses to sell guns in Missouri. This data shows the number of licensed dealerships by unique business name sorted by largest number to smallest. In these examples of data management, the journalist only has to do one calculation: subtraction (in the healthy life expectancy dataset, where male ages are minused from female ages). The software does all the other counting and arranging. Journalists can rapidly total columns of numbers by using the formula or icon for summing a column. 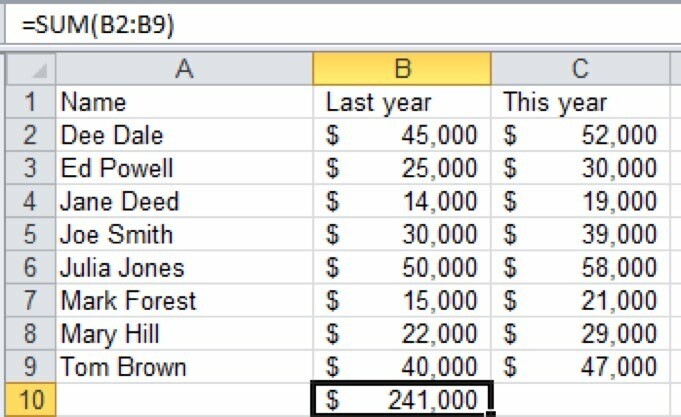 The icon in a spreadsheet is one way to do a sum, but if there are blank rows it is better to put in the specific range of numbers. Here is a list of salaries at an imaginary government agency. The icon can be used for one group, but because of the blank row it will stop at that group unless the range is dragged upwards. It is easier to do this calculation =sum(b2:b9) than worry about missing a row when specifying the range. This is a fictional dataset on municipal salaries earned by political appointees with the total salaries added for the previous year. The brilliance of a spreadsheet is that it maps the data, which allows formulas to calculated and copied easily. Instead of doing calculations with numbers, journalists can use the ‘addresses’ of the numbers. The mean is often known as the average and, in fact, spreadsheets use the word average for the calculation. But be wary: means can obscure the effect of a large number on the average – such as a CEO or a team’s superstar – or of a small number – such as a group of lowly paid workers. A median, in which half the numbers are higher and half are lower, can serve as lie detector and can correct for those ’outliers’. For example, a team of five athletes has one star and four regular players. If the average is calculated with the formula =AVERAGE(b3:b7), then the average salary is $158,000, thus making it appear that most players are making $158,000. A fictional dataset of the game salaries for professional basketball players. 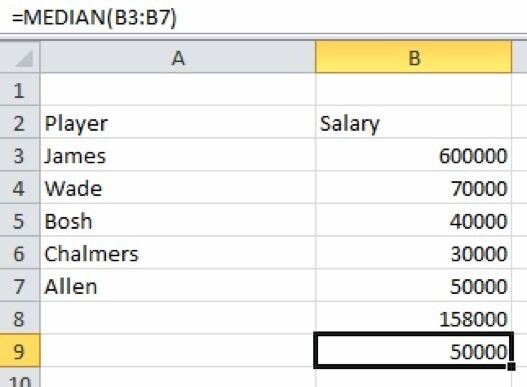 However, the median with the formula =MEDIAN(b3:b7) shows that the median salary is $50,000, which is a much more accurate indication of what most of the players are making. By reporting only the average, a journalist would mislead the audience into thinking players are making much than they are. So, to calculate a percentage difference, last year’s wage is subtracted from this year’s wage. Then the difference is divided by last year’s wage. With this calculation, the actual impact on each worker is seen. These are not the usual raises, of course, but fictional ones given to a politician’s associates. This dataset shows the percentage difference calculated between last year salaries and this year’s salaries. Percentage difference is used in many reports -- budgets and trade, for example -- to show both raw numbers and how they compare to each other. 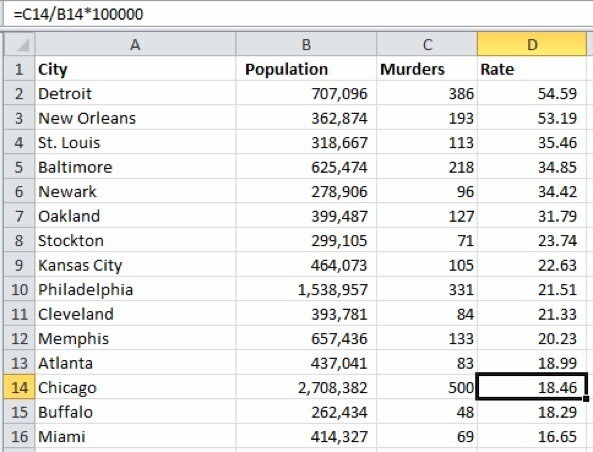 Actual data from the Federal Bureau of Investigation with the murder rate calculated for the larger cities in the US. A rate is calculated by thinking of the number of incidents per population (which could mean people, number of vehicles if its traffic, and so on). In the case of murder rates, it would be number of murders divided by the city population. In this example, the US city with the most murders (Chicago) does not have the highest murder rate. Ratios are numbers that are extremely useful when writing about numbers. It can be much more concise to write that one number is double that of another, rather than it is 100% higher. It can be quite startling to find one group of people is jailed twice as often as another, or a pharmaceutical drug has a success rate three times higher than another. For example, one ethnic group has 8000 persons jailed each year. Another group has 4000 persons jailed each year. By using the formula =8000/4000 the ration is determined to be 2 to 1, or double that. If the first ethnic group makes up only 10% of the total population, then a journalist has the beginning of an inquiry to answer why. For more on using spreadsheets, check out our video courses Doing Journalism with Data: First Steps, Skills and Tools and Cleaning Data in Excel. You can also start a conversation in our forums. These basic functions and calculations allow journalists to overcome a fear of numbers and to leap into using math for stories. 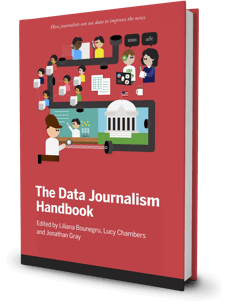 If the growth of data journalism is anything to go by, the adoption of these new skills benefits both the field and newsrooms, with inquiries that are more accurate, use better comparisons, and give greater context. It all adds up to what every reporter strives for: meaningful and insightful journalism. And that is no laughing matter.